The idea of attaching a numeric value to each of your clients and scoring their likelihood to purchase from you might seem impossible—especially since everyone has a different business and product to promote. However, with Salesforce and marketing automation, you can do just that. Salesforce allows you to customize your lead scoring qualifications, and the benefits of lead scoring are numerous. Imagine looking at your leads and being able to skip straight to the ones that are most likely to purchase from you. Not only does this save time and boost revenue, it also boosts the confidence of your sales team. Simply put, lead scoring in Salesforce rates leads based on data gathered from parameters you set up as well as information obtained from online buying signals. The first way to grade your leads is by selecting the type of people that are most likely to become customers. For example, how much revenue does their business or household generate per year? What is their position in the company? What is their geographical location? Is your product geared more towards a specific age group or gender? You get to choose which criteria are important to your company. The second aspect to lead scoring is more hands-free for you. It tracks the customer’s activity during their time in contact with your company and then keeps score. For example, Salesforce and your marketing automation platform look at how many times the customer has viewed your website, how many times they have downloaded information you sent, whether they opened your emails, whether or not they clicked on the links within the emails, and if they attended webinars or watched your videos. An engaged lead is more likely to purchase from you. One that ignores your marketing attempts is not. With your marketing automation tool you can set parameters to target people from a certain industry or a particular geographic location, but for all you know, they may have zero interest in your product and you could waste months trying to convert them into a customer. Lead scoring makes the lead nurturing process easier because you know where to spend your energy. It’s a good practice to follow up with all of your new leads because you never know for sure who will buy and who won’t. 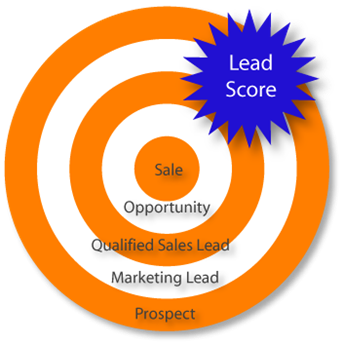 However, lead scoring will help your sales team be more effective when following up with their leads. When you use lead scoring in Salesforce, members of your sales team can see which leads are showing more interest and which ones are not. They can then spend time accordingly by spending more time on high scoring leads, and less time on lower scoring leads. Although you still want to reach out to all of your leads, lead scoring will help your sales team use their time more effectively, and can increase their win rate by focusing on higher quality leads from the beginning.